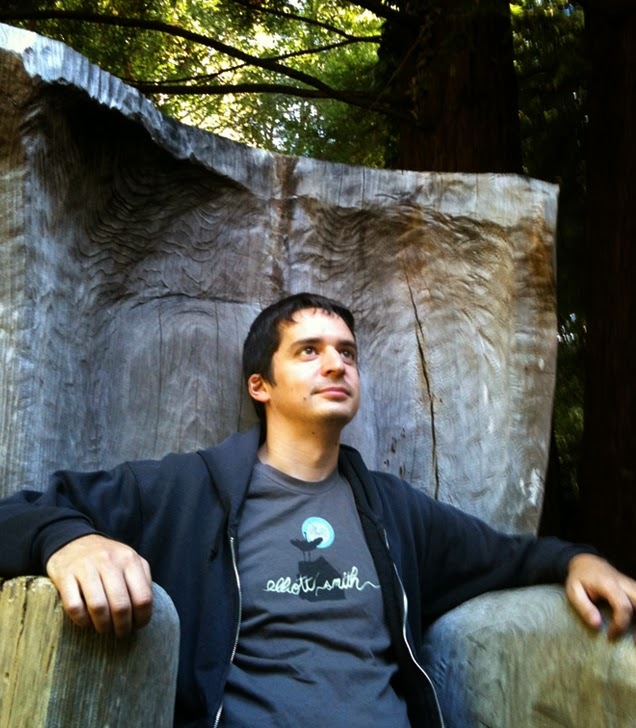 Jason Martin is a longtime zinester and cartoonist from the Bay Area. He is best known for his autobiographical series Laterborn, eight issues of which have been released so far. 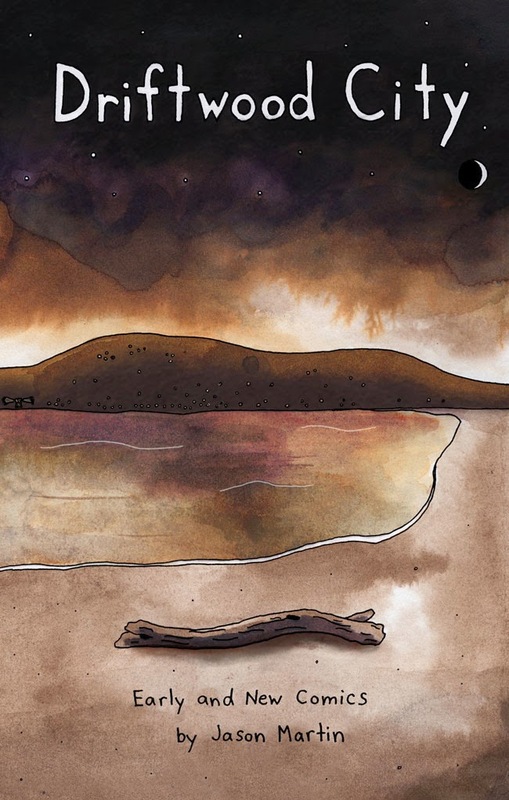 Last year he collected the best of the first six issues along with five new stories into the book Driftwood City, which easily made my annual Top 20 list of 2013. Another "Martin Must-Have" is Papercutter #17 (2011), the final issue of the much-admired comics anthology from Greg Means' Tugboat Press. Martin wrote all the stories in this Ignatz-nominated edition, illustrated by a stellar crew of indie cartoonists, including Vanessa Davis, Hellen Jo, Jesse Reklaw, and Calvin Wong. He has also released three issues of the solo zine series Black Tea, a recent collaboration with pals Leo Lopez and Caroline Saddul called I Hugged This Pony Today, and has contributed to a variety of books and anthologies including I Saw You, Not My Small Diary, and Runner Runner. Jason's work is marked by a stark, aching sincerity. He excels at capturing those small moments that every life awaits: moments where we genuinely connect with one another in friendship, solidarity or understanding, or when a favorite song or piece of writing acts as a reminder of the curious, joyful intensity of just being alive. His stories have at times moved me to tears. I wanted to know more about Jason and his work, so I emailed him a bunch of questions late last month. Read along with me, won’t you? Rob Kirby: Which came first for you (if either), the writing or the drawing? Jason Martin: Probably the drawing. I made my own Batman comics in elementary school (which I wrote about in Papercutter #17), then drew gag comics with my friend in junior high, and some hard-hitting “editorial” cartoons for our school paper in 8th grade. In high school I got more into short story writing, and I ended up majoring in Creative Writing in college. What finally bridged the gap for me was Michel Rabagliati’s comic “Paul: Apprentice Typographer” in one of the Drawn & Quarterly books. When I read that comic I thought, “This is as good as the best short stories I’ve read." It spoke to me way more than the “literary” stories coming out at the time, which were mostly about professors cheating on their wives. Kirby: Ha! I know what you mean about those oh-so-literary stories! And I will have to check out the Rabagliati piece, for sure…do you remember specifically what title was it in? Martin: Let me check my shelves... looks like it’s called Drawn and Quarterly, Volume 3. It’s a big coffee table book with a lot of great stories, and I actually first discovered it on my friend Robert’s coffee table. This was back in 2001, and now I have a list a mile long of comics that I'd consider literature, like One Hundred Demons by Lynda Barry, Monsters by Ken Dahl, the QU33R anthology you edited, all the mini's I wrote about for Jason's Zine Club (on my website), etc. Kirby: Can you remember when and where you first became aware of the small press & zine world and the kind of effect it had on you? Martin: There was a guy in my high school who made a zine, but I didn’t really get into that world until college. My friend Leo and I made a funny and random zine called Pizza Ga Tabetai. 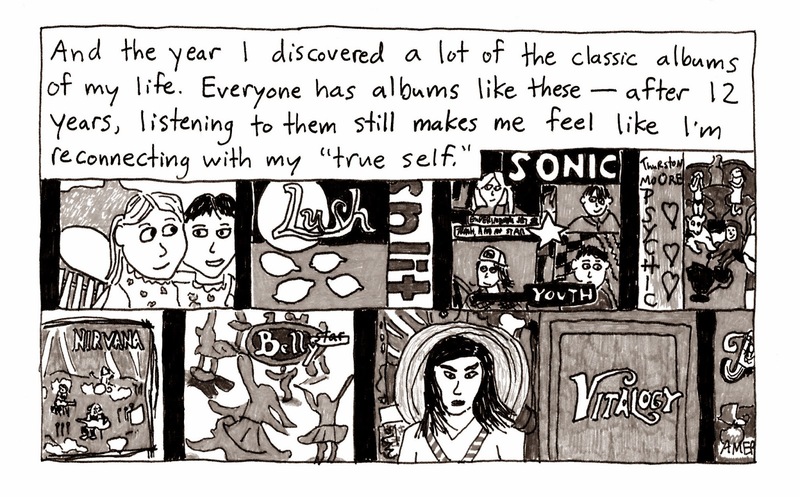 Around that time I also started reading Zen Baby, which was a local zine sold at Streetlight Records in Santa Cruz. I actually became pen pals with the guy who made it, which is funny since we both lived in the same town. And I remember buying an issue of Doris at City Lights in my senior year of college, and being really inspired by it. But King-Cat was definitely the zine that had the biggest impact on me. I went through a really low point in my life after college, and I think part of it was that I always related to those overly-sensitive characters in coming-of-age stories, but when I hit my 20’s I started freaking out, thinking, “What happens to us as adults?” The books never made it that far. Luckily, my friend Yasi lent me almost the entire run of King-Cat during that time, and something about it reassured me and made me really excited about life again. And of course all these zines eventually inspired me to self-publish my own writing and comics. Kirby: Music seems to fuel much of your creative mojo. What band(s) have you played in and what kind of musical realm(s) did it fall into? Martin: Music is definitely my #1 obsession, but playing music is more of a hobby for me these days. I play keyboards for my friend Adam Lipman sometimes. Before that I played bass in my friend Jon’s band Chinatown Bakeries, which was an indie-folk band with up to 9 members at one point (and a lot of smaller bands within the band, some of which I also played in). And then there’s my high school band, Kilmore Trout, which I’m always referencing in my teenage comics. The more time goes by, the more I realize how good and original we were. Kirby: Some of my favorite stories of yours center around teachers/educators who have inspired you in some way: "Who Are You?" and "Tribute to Lucy" and "The Weaving of a Dream." Is there something about teachers that inspires you to write about them specifically or do you feel you've just been lucky that you've had these people, however briefly, touching upon your life? Martin: I actually just got a beautiful letter from Marilee Heyer yesterday (the author of The Weaving of a Dream). I finally worked up the nerve to send her a copy of Papercutter #17 last year. I’ve never really thought about it before, but a lot of my comics are about the people who helped make me who I am. This includes school teachers, but also people like my friend Lyal, the goth girl I had a crush on in high school, Dylan Williams, Mike Watt. All good teachers in their own way. Kirby: Have you personally ever taught a class? Martin: No, but I worked as a writing tutor for my college, which is one of the best jobs I’ve ever had. Kirby: I remember once reading Tori Amos saying, "If you hate everything you do, there's a problem. If you love everything you do, that's a problem." Any thoughts on this? Martin: Hmmm… it reminds me of something Charlie Kaufman said: “Failure is a badge of honor. It means you risked failure.” I guess it’s about getting out of your comfort zone, instead of just repeating what you know you’re good at. But quality control is also important, so I can’t agree with Tori 100%. I have such a limited time to work on comics that I try to only focus on my best ideas, or the ones I’m most excited to work on. Kirby: A hearty congratulations once again to you and your fiancé on your upcoming nuptials! Is Michelle a creative person as well? Martin: Thanks! Michelle is really outdoorsy and social, which is a good match for a cartoonist. She gets me out of the house and around people. But she’s also really creative in different ways. I show her most of my comics while I’m working on them, and always get good feedback from her. And she’s really talented with photography, and with doing impressions and cartoon voices. Kirby: A hallmark of these interviews (all three of them to date) is the Totally Random Stupid Question. This one's for you, Jason Martin: What's the worst fashion era, the 1970's or the 1980's? Martin: I’m gonna say 80’s. Almost everything was at its worst in the 80’s (except underground music). Kirby: I've noticed collaboration is a consistent theme with you (at least in my questions to you here). What is it about working with others that is attractive for you? Martin: I mostly collaborate with my friend Leo. We had so much fun working on our zine in college, and we’ve been able to tap back into that pretty easily over the years. 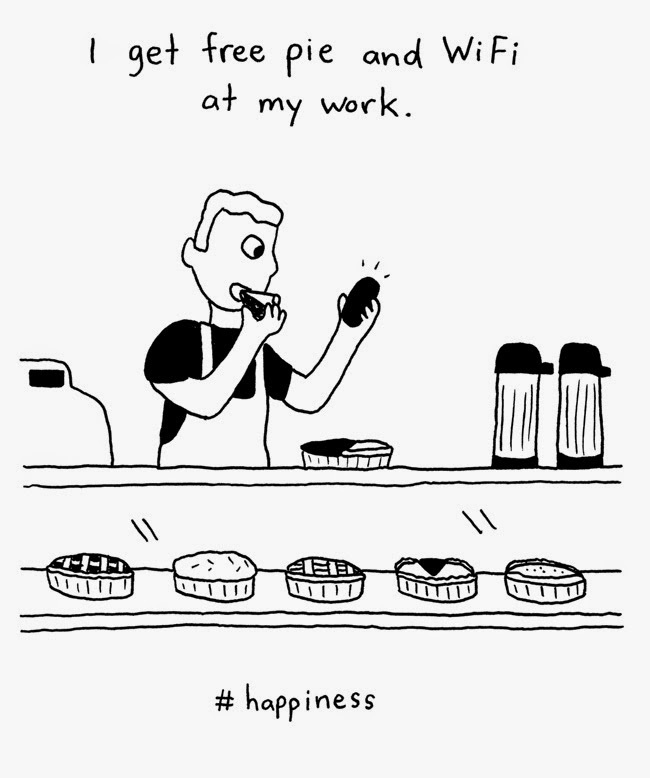 Our latest project is a collaboration with our friend Caroline, where we found funny tweets with the hashtag #happiness and adapted them into comics. 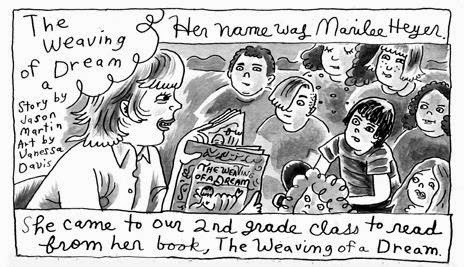 When I collaborated on my autobio stories for Papercutter #17 I was more uptight and probably a pain to work with at times, but after seeing the finished comics I realized they were always in good hands and I should’ve relaxed more. I recently wrote a comic for Tessa Brunton to draw in the next Tugboat Press anthology, and this time I was more laid back and hands off. Believe it or not the story came out just as great this way. I’m learning! Kirby: Can you tell me about the upcoming comics & projects you've got going? What's this about you and (UK cartoonist) Simon Moreton working together? 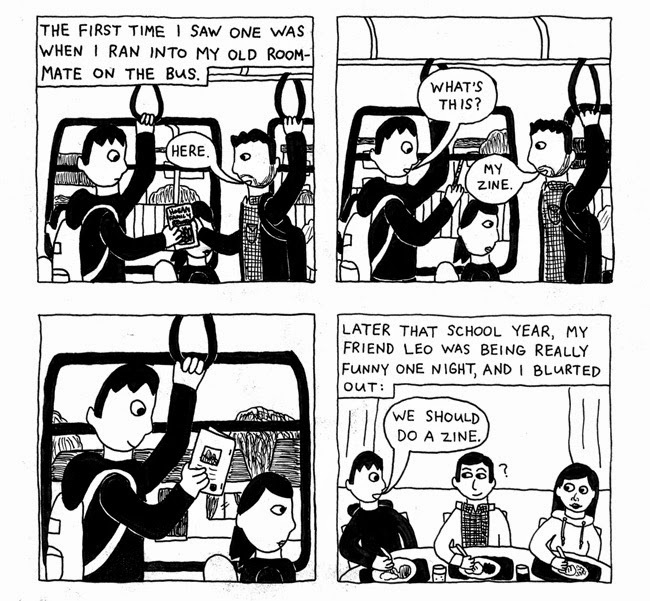 Martin: Simon and I are doing a split zine, where we’re both making comics centered around one theme. I think that’s all I can say for now. I’m really close to finishing another zine, where I’m taking my favorite stories about musicians and adapting them into comics. I think it’ll be called COVERS (since I didn’t write any of the stories), and it’s been one of the funnest projects I’ve ever worked on. I’m also working on another zine of autobiographical stories – I’m not sure if this’ll be Laterborn #9 or Black Tea #4, or maybe a new title. I go back and forth.